On Saturday, June 27th, Kimberton Waldorf School is hosting a benefit concert for their Middle School Atrium Restoration Fund. 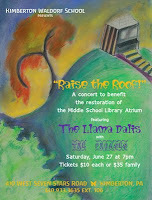 The concert begins at 7pm and features headliners The Llama Dalis. Tickets are $10 per person or $35 for the entire family. The Kimberton Waldorf School is located at 410 West Seven Stars Road, Phoenixville, PA. Click here for more information on the Atrium Restoration Fund. Can someone post if this is indoors or oudoors... thanks! The Llama Dalis are awesome. If you can make it to this show, you won't be disappointed! The concert is outdoors if Mother Nature cooperates. And yes, The Llama Dalis are awesome! Mother Nature did indeed cooperate and we had a very successful fundraiser for this worthy cause, as well as a rocking great time under the stars! Thanks to The Llama Dalis, The Phrases and everyone for making this a perfect evening!